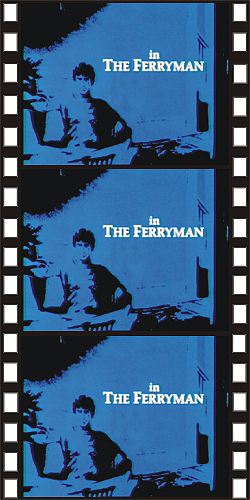 THE FERRYMAN (1974) Jeremy Brett, Natasha Parry, Geoffrey Chater, Lesly Dunlop, Andy Bradford. This is a cool 50-minute TV feature about a horror novelist and his wife who go to a house in the country for a short holiday. To their horror, they soon realize that one of his horror novels is coming true when they are haunted by the ghost of a dead ferryman. Very creepy and atmospheric. Bound to give you a bad dream or two. Nice color, taken from an original broadcast tape.